The B. Fashion Spot : Upcoming Art Show Event!!!!! Recently I learned about an upcoming Art Show Event that is going to be AWESOME!!!!! You cannot miss it!!!!! Well I have been told that there will be several begining artists showing their work. Each of them will expose to the public their different art skills and abilities. * What type of artists will I find? * And my favorite... Watercolorist. I know one that will be there. She is AMAZING and her work is FLAWLESS!!!!! She is wonderful, kind and super sweet. Her name is Deborah Thomsen Walker and she is the owner and founder of Purely Zen Art Studio. You should go and support her work style on that day. * When and Where is the Event?! 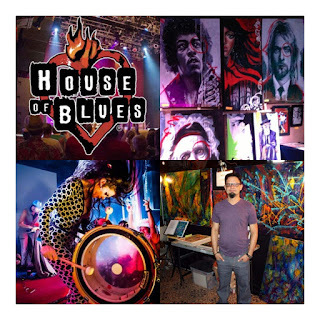 The event is on October 5th at the San Diego House of Blues. * What other things may I see there? As you can see I am not going to spoil the fun out of it and tell you all the details. You will just have to go and find out!!!!! Believe me it will be lots of fun. No. Sorry. You have to buy the presale tickets. They are $20.00 dollars and they can be bought online only. Get your tickets today before they are all gone!!!!! It helps contribute towards her booth too. Well you guys, I hope you get to buy the tickets and support your local artists!!!!! They are SUPER COOL. And so is my friend Debbie from Purely Zen Art Studio. Her work is BEAUTIFUL. Go and have fun!!!! You'll thank me later for spreading such a nice, family and fun event. Till next time!!!! Xoxo. B.